To think, there was a time when I hadn’t heard of Luis de Freitas Branco. In the last couple of years I have reviewed his Second Symphony (Naxos 8.572059) and the Third (Naxos 8.572370) and purchased the First Symphony (Naxos 8.570765). I have come to really admire and to enjoy his almost unknown work. The booklet notes were been written by the conductor and he comments that “Freitas Branco is the most important Portuguese composer of the first half of the twentieth century”. And he should know because he has recorded all of the works and is a recognised expert on the composer. However, I still cannot understand why an Irish orchestra, as good as they are, have been chosen to record them. The same goes for the Marco Polo CDs of the orchestral works of Joly Braga Santos (Freitas Branco’s pupil). Surely a Portuguese orchestra would do as good a job, and might even already know some of the music. This, Freitas Branco’s Fourth and last symphony begins (like the Mass) with a Gregorian melody in unison, the Kyrie Eleison. It then launches out on a journey investing occasionally in other ‘plainchantey’ tunes but never repeating its opening. The first movement - which is eleven and a half minutes long - is a vast ternary structure once the Allegro kicks in but with the A section falling into several sections. Whilst listening I was asking myself if there is anything about this music which is especially Portuguese; certainly there’s nothing Spanish about it. My all too-brief excursions into Portugal - and I don’t mean just the Algarve but into the smaller towns and countryside of what is a very beautiful and varied landscape - have introduced me to a religious, noble and proud people - even more so I should imagine in Freitas Branco’s day. They are a nation full of colour and able to be festive despite their in-built passion and gravity. These characteristics can be sensed in this music. And as we embark on the second movement, an Adagio, we encounter another characteristic, that of an aching fervour which although calm has deep undercurrents of seriousness. This is a gentle episode building to a “majestic conclusion”. The Scherzo, which follows, includes a tambourine reminding us of the dancing which one sees in villages all over the country especially in celebration of saint’s days. It is brief and acts as an introduction to the vast finale. This begins portentously and ends with a noble Elgarian chorale; after all St. George is Portugal’s patron saint as well! In between it moves through an almost pastoral allegro but with contrasting tempi surrounding it. This is often light, mysterious and fleeting and often fervent and strong. Despite its length this movement - and indeed this very enjoyable symphony as a whole - does not outstay its welcome. Of all of the composer’s symphonies it is this one that I might well return to most often. The other work on this generously filled CD is Vathek subtitled a Symphonic Poem in the form of Variations on an Oriental Theme. It is truly original and remarkable both in its structure and in its harmony and orchestration. 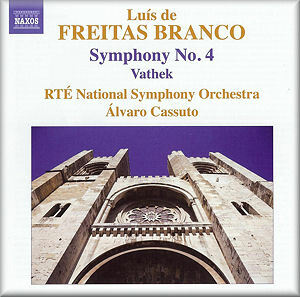 It brings this series of Freitas Branco orchestral music to a marvellous conclusion. The symphonic poem, which may well have been inspired by early Stravinsky and certainly by Rimsky-Korsakov, has a curious form which has been dictated by a story-line based on a novel by William Beckford. It concerns Vathek the Caliph of Samarah who has five palaces build for him each dedicated to a different sense. It would have created an almighty storm in 1913 about the same time as the premiere of ‘Le Sacre’ had it been heard then. Its experimental harmony from a man of just 23 years is quite remarkable. That said, he had been moving towards some sort of harmonic experimentation a few years earlier in his Artificial Paradises of 1919 (found on Volume 2 in this series). This work which was not played in its complete form until 1961 begins with a brass Introduction that is polytonal and would have hit the original audience hard. They were, after all, used to a diet of Tchaikovsky and highly conservative and now forgotten Portuguese masters. The theme is announced on a solo bassoon, which is deliberately oriental in contour. Then there is a Prologue with an extraordinary twelve-tone chord built in fourths. This is not dissimilar to the one Stravinsky conjures from the strings at the end of ‘The Sage’ (bar before Fig 72 in Le Sacre). The five variations which follow represent the five palaces: first of the ‘Eternal Feast’, secondly a gloriously romantic ‘Temple of Melody’, then an extraordinary ‘Delight of the Eyes’ Temple which Freitas Branco sets as a brief ‘fugato in 59 voices’ a cacophony of counterpoint which I wont even attempt to describe. Fourthly we have a ‘Palace of Perfumes’ and finally a ‘Refuge of Happiness’ in which an oriental dance is set out for us accompanied by beautifully and scantily clad maidens. The composer cogitates on these matters in a bipartite Epilogue, which ends in a grand chorale. So, for much less than a mediocre bottle of Port this CD is well worth investigating, as indeed are any of the four devoted to this composer. I for one am very pleased to have been given the chance by Naxos to get to know this most enjoyable and interesting composer.